This image demonstrates the first detection of Pluto using the high-resolution mode on the New Horizons Long-Range Reconnaissance Imager (LORRI). The mode provides a clear separation between Pluto and numerous nearby background stars. When the image was taken on October 6, 2007, Pluto was located in the constellation Serpens, in a region of the sky dense with background stars. Typically, LORRI�s exposure time in hi-res mode is limited to approximately 0.1 seconds, but by using a special pointing mode that allowed an increase in the exposure time to 0.967 seconds, scientists were able to spot Pluto, which is approximately 15,000 times fainter than human eyes can detect. New Horizons was still too far from Pluto (3.6 billion kilometers, or 2.2 billion miles) for LORRI to resolve any details on Pluto�s surface � that won�t happen until summer 2014, approximately one year before closest approach. 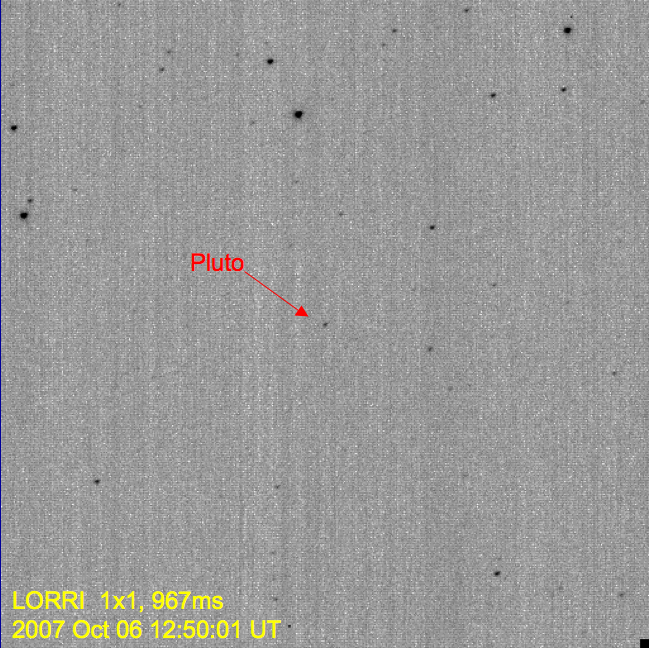 For now the entire Pluto system remains a bright dot to the spacecraft�s telescopic camera, though LORRI is expected to start resolving Charon from Pluto � seeing them as separate objects � in summer 2010.